The potential of the do it yourself strategy in the production, distribution, and promotion of punk records may be better understood not as a rigorous anti-capitalist strategy, but as a strategy for creating (or attempting to create) autonomous spaces within the market economy. When it started, grime was a young black man’s punk rock. In 2003, Dizzee Rascal’s debut album Boy in Da Corner won the Mercury Music Prize. It seemed like it would be a watershed moment for grime, which was beginning to emerge from the east London council estates in which it had been conceived and incubated to make its mark on the British popular consciousness. Yet although Dizzee himself would go on to become a bona fide pop star, most of his peers would spend the next decade continuing to make music for a relatively small, local audience. In recent years, however, grime has become a major commercial and cultural force. Thirteen years after Boy In Da Corner’s victory, the 2016 Mercury was awarded to Skepta for his fourth studio album Konnichiwa. Soon after, Stormzy’s Gang Signs and Prayer reached number 1 on the UK Album Chart, with records by Giggs, Kano and Wiley also hitting the top ten. Lady LeShurr’s ongoing Queen’s Speech YouTube series has amassed more than a hundred million views. North London crew Boy Better Know have collaborated with international superstars like Drake, while the #grime4corbyn hashtag signifying support for Jeremy Corbyn’s Labour Party has been credited with encouraging youth turnout in the 2017 UK General Election. Why might grime be of interest to International Political Economy? Its prominence within British popular culture and its apparent status as ‘Britain’s next big cultural export‘ might provoke questions about its authenticity: is it ‘underground’ or ‘mainstream’? Are its MCs ‘keeping it real’ or ‘selling out’? Yet for all their convenience, such questions do not inspire hugely persuasive answers, because they suggest that the relationship between culture and the market can be clearly categorised: opposition and ‘outsider’ status on the one hand, or collaboration and complicity on the other. Such black-and-white distinctions are unable to account for the complex and dynamic ways in which cultural and political-economic forces intersect and interact. Instead, grime might more profitably be considered as a field of cultural practice where some of these complexities can be identified and traced. On one level, it is unavoidably a market product: it costs money to make and it generates revenue in its dissemination and performance, a point only magnified by its recent commercial revival. Yet this has not prevented grime artists engaging with their social, political and economic contexts in creative and often resistant ways. The genre’s relevance to IPE, then, lies in the cues and clues it offers regarding the possibilities and limits of social and cultural agency in a world powerfully determined by market forces. What patterns of production, dissemination, and consumption have accompanied and shaped grime? In the beginning – around 2002 – grime artists had no choice but to operate at the margins of the established music industry. Well-equipped recording studios, major-label distribution networks and commercial radio stations were completely inaccessible to the young, working-class, mostly black men who comprised the genre’s first wave of DJs, producers and MCs. Moreover, although the internet had begun to disrupt established patterns of music consumption, it was not yet the ubiquitous platform that it is today: downloading was painfully slow, and streaming entirely impossible. Unable to access any pre-existing infrastructure, then, grime artists instead constructed their own. The methods and strategies that early grime artists developed in order to produce, perform and distribute their music drew inspiration from Jamaican soundsystem culture and from the network of pirate radio stations that had sprung up throughout London over the previous decade. Instead of producing thousands of records or CDs to be sold to a general public, artists would instead press a handful of ‘dubplates’ (made with cheap lacquer rather than durable vinyl) to be given to DJs who would then play them at raves or on pirate stations like Deja Vu or Rinse FM. It was through these parties and broadcasts, rather than through the sale of records, that grime cultivated – and communicated with – its early audience. As such, the music was not initially disseminated or distributed according to any sort of ownership model: indeed, in many cases, there was no CD or record that could be bought at all. There are consequently classic tracks such as Ruff Sqwad’s ‘R U Double F’ that have never received an official release, existing today only as low-quality radio ‘rips’. This resourceful ‘do it yourself’ ethic is in many ways analagous to that of the punk scene twenty-five years previously. Instead of making music in expensive studios, producers would make tracks on free programmes downloaded from the internet like FruityLoops, or even in some cases on Music 2000, a game made for the first-generation Sony PlayStation. And many DJs and MCs did far more than writing, recording, and performing music: they pressed ‘white labels’ for small-scale releases, put on their own raves, started pirate radio stations or performed the day-to-day chores that kept them on air. This latter task could include climbing onto the roofs of tower blocks in order to install and fix transmitters and/or aerials, a job which landed DJ Slimzee an Anti-Social Behavioural Order, or ASBO, in 2005. Barred from the fourth floor or above of any social housing block, Slimzee was unable to access the high-rise flats from which Rinse FM used to broadcast. Grime’s initial self-sufficiency might have enabled it to operate largely independently from the music industry’s established channels of production, distribution and consumption. Yet one might ask to what extent this independence has been affected by the genre’s recent commercial resurgence. How, then, has grime’s relationship with the market altered in the face of its new-found success? That’s where we are right now, fam… Everyone in the crew is just, like, tunnel vision – it’s family, it’s what we care about, or nothing – like, literally, there’s no money that record labels can offer us no more. It’s dead, it’s just… there’s no point in saying these numbers to us anymore, because we’ve seen them, yeah? In some senses at least, grime continues to operate according to a DIY model. Most of its biggest stars continue to release their music independently rather than with major record labels, while at the grassroots a number of amateur or semi-professional YouTube channels like Grime Report and GRM Daily provide a platform for up-and-coming MCs. Pirate radio stations remain plentiful, and internet-only stations like Radar Radio and NTS also devote significant airtime to emerging producers and MCs. Although the rave culture that was so important in grime’s early days has admittedly faded somewhat, it has also faced significant practical and political impediments. The controversial Form 696, for example – a mandatory ‘risk assessment form’ for live events introduced in 2008 by London’s Metropolitan Police – initially asked questions about the ethnic makeup of prospective audiences in ways which were perceived to be targeting black-majority genres. The policy was finally scrapped in November 2017. While the fierce sense of independence that defined the genre in its early days persists to some extent, then, it is also the case that grime’s current popularity has entailed a certain ‘accommodation’ with market forces. For the bigger artists, spots on daytime radio playlists and bookings at major venues like London’s O2 Arena are now viable possibilities. Brixton’s Big Narstie has become a popular TV personality despite not yet having a top 40 single to his name. 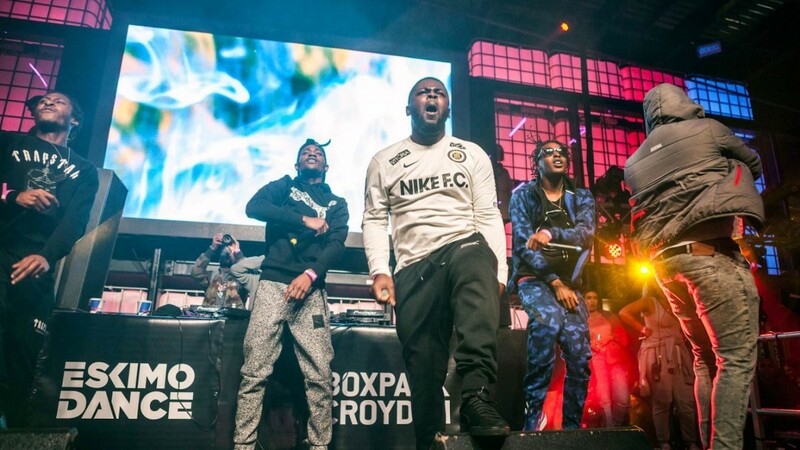 And the ongoing gentrification of grime’s heartlands in east and south London continues to reshape its terrain: the 2017/18 New Year’s edition of Wiley’s semi-regular rave Eskimo Dance, for instance, was held at Croydon Boxpark, a pop-up shopping centre. Grime’s recent history, then, is at least to some extent one of assimilation into an economy of exchange: as Matt Davies acknowledges, ‘[while] “do it yourself” is the “indigestible” moment against commodification… [it] is also [itself] subject to commodification’. 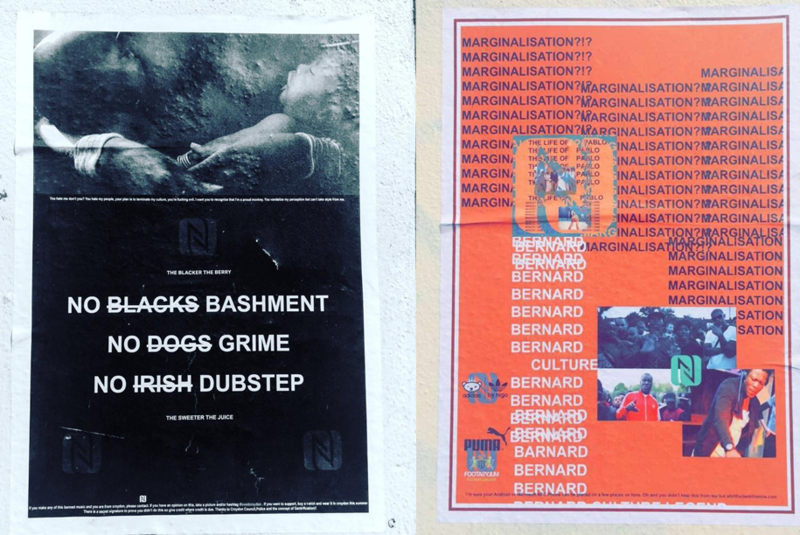 This raises difficult questions about how grime – as a (largely) black cultural product – intersects with an economic sphere founded upon racial division and hierarchy. As Spike Lee’s 2000 film Bamboozled makes brutally clear, the culture industry has consistently exploited particular visions of ‘blackness’ for the entertainment of white audiences and the enrichment of white executives and investors. And so while Nike’s February 2018 advert starring Skepta, Giggs and J Hus has been widely praised for its celebration of London’s cultural and racial diversity, more ambivalent readings have also been proposed. In Yewande Adeniran’s words, ‘Our blackness is exciting and cool as long as it’s raking it in’. One might therefore conceivably connect grime’s current cultural prominence to its ‘crossing over’ to a white audience, and to a raced market sphere that works to reinforce the privilege of that audience (of which, it should be acknowledged, I myself am a part). Yet even as London’s grime scene has gained nationwide prominence, the genre has simultaneously become the medium of choice for a number of marginalised provincial voices. No longer the unique sound of Tower Hamlets and Tottenham, grime MCs can now be found in Paisley and Sligo. While grime has become commodified to some extent, then, it nevertheless continues to provide a mouthpiece for un- or under-represented voices, dialects and social groups. Although this relative inclusivity is not without its significant blind spots – most obviously, and notwithstanding some notable exceptions, grime MCs are still overwhelmingly male – it is nevertheless clear that grime remains an appealing medium of expression for many disenfranchised or alienated young people. Despite its gradual integration into ‘mainstream’ popular culture, then, the independent grassroots networks that grime sustains continue to afford a great deal of creative possibility for people unable or unwilling to tap into established market channels of production and distribution. Cultural practices are of enormous importance in understanding global political-economic processes. Market forces shape popular beliefs, practices, tastes, and styles that in turn influence patterns of consumption and production. Grime is just one site where these dynamics might be traced, but it is a provocative one because the voices it amplifies are in many ways defined by a certain marginalisation from established political-economic systems. Although it would be a stretch to describe grime as ‘anti-capitalist’, it is nevertheless a site where important struggles for social and cultural identity and autonomy in the face of an overbearing market economy have taken place. At the ceremony for the 2003 Mercury Prize, the assembled dignitaries were shown a video in which Dizzee Rascal led viewers around his local neighbourhood of Bow, directly east and north of London’s two financial districts (located in the City and in its redeveloped docklands respectively). In the video, Dizzee gestures towards the shiny skyscrapers dominating the skyline to the south: ‘That is Canary Wharf. It’s in your face. It takes the piss’. Best, J. and Paterson, M., eds. (2010). Cultural Political Economy. London & New York. Griffin, P. (2015). Popular Culture, Political Economy and the Death of Feminism. London & New York: Routledge. Wiley. (2017). Eskiboy. London: Random House. Tilley, L. and Shilliam, R. (2017). Raced Markets: An Introduction. New Political Economy, online only. Barron, L. (2013). The sound of the Street Corner: UK grime as ethnography. European Journal of Cultural Studies, 16(5), pp. 531-547. Charles, M. (2016). GrimeCentral! Subterranean ground-in grit engulfing manicured mainstream places. In: Andrews, K. and Palmer, L. A, eds. ‘Blackness in Britain, Oxford: Routledge. ‘Havana/Functions On The Low’ – Crazy Titch/XTC, 2004.